NanoMagic specialize in wood substrates impregnation, especially natural wood, but also MDF, OSB, plywood and particleboard, etc. NanoMagic hydrophobic coating for wood can protect unpainted wood such as garden furniture, wooden houses, inside and outside paneling, saunas, trims around the swimming pools, wooden sculptures, garden fences and many others. Nano wood impregnate creates an invisible protection against dirt, moisture, lichen and microorganisms while ensuring maximum permeability. Wood retains the original appearance, without changing the parameters of its utility. Advantages and Benefits of NanoMagic Wood Impregnation: - Does not change the natural appearance of wood, - Prevents physical, chemical and biological erosion of wooden surfaces, - Dirt, sludge, dust and mud (including grease and oil) is easily removed with clean water (preferably under pressure), - Inhibits the development of moss, algae and mold Maintaining "breathing" of the surface, - Long-lasting protection of surfaces against water, dirt, grease and oil. Hydrophobic coating for wood protection. 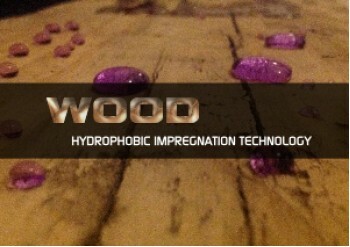 Wood protective coating, wood impregnate. The raw wood d..